Unidentified Hoya species #CMF-8 is probably the most maligned of all hoyas and one of the loveliest. It was collected by the well known professional photographer, Charles Marden Fitch, in the early 1980s. Cuttings were sent by him to me. I thought then that it was Hoya bordenii. I was wrong. I still think it very close to that species in many ways. After getting an expensive microscope and some photographer helpers (both degreed scientists) I was able to get a better look at the flowers of this and many others. This made me realize my error. So far it has not helped me identify this species. Mr. Kloppenburg has made a career, more or less, of misidentifying this hoya. 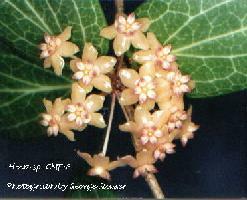 He first misidentified it, in his Phillipine (sic) Hoya Species as Hoya macgregorii Schltr. Although I don’t believe it is that species, I have heard at least one very convincing argument in favor of that identity. The arguer stated that the since all other parts appeared to match that, perhaps the one really radically different part might look as Schlechter’s type did when pressed, dried and mounted on a piece of paper. That radically different part is the corona. The Hoya macgregorii type’s corona lobes are obcordate (heart shaped with broad end pointing out). The corona lobes on CMF-8 are more or less elliptic in shape and rather acutely tipped at both ends. To that he added a list of literary citations, all of which he had seen and most of which I have seen. It is a real mystery to me how Mr. Kloppenburg and Ms. Wayman ever got the ridiculous notion that this species could possibly be Hoya cagayanensis. Is it blindness? Something they smoke? Senility? Did some men in white coats, or from a space ship, tell them it is Hoya cagayanensis? Can anyone think of a logical explanation? Figure 1. This is a set of sketches, drawn by R. Schlechter and attached to the holotype specimen by him. I added the letters to the parts for easy reference. Having had the entire extant Schlechter herbarium collection on loan here, at Fernbank Science Center, in Atlanta, for several months, I had the opportunity to see and compare the actual flowers on it with Schlechter’s sketches. I found them to be accurate though, rather crudely drawn. I am 100% sure that Ms. Wayman, who claims to have made this ridiculous determination has seen no more than a Xerox copy of it, if that. 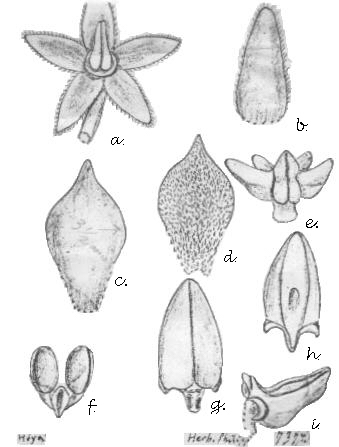 Figure 2: A set of sketches, by Christine M. Burton of Unidentified species CMF-8. 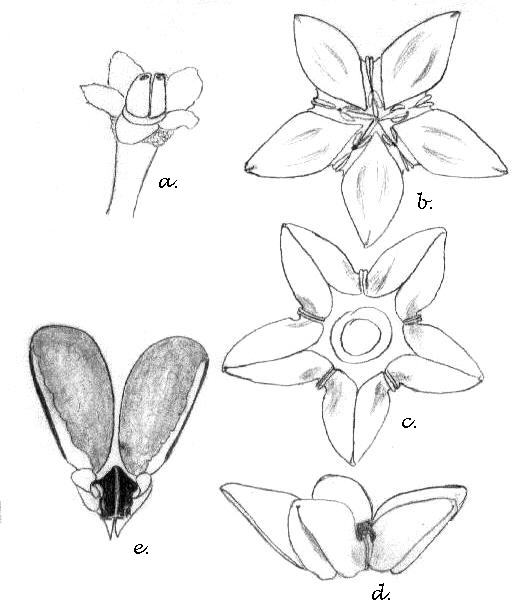 These sketches are actually tracings of photomicrographic pictures of the various flower parts of this species. Figure 1, part a. (the calyx) shows sepals that are long in ratio to width and rather thickly ciliate. Figure 2, part a. (the calyx) shows sepals that are short and rather broad with all sides almost equal and with only an occasional hair, growing here and there around their margins. Figure 1, part h. (a single corona lobe viewed from directly above) and part i (a single corona lobe’s profile). Part h shows us a corona lobe with broadly rounded sides and a top that looks flat but with an umbo in the center of the upper half. Go on down to part i and you can see that what appears to be a flat corona in part h is an optical illusion, caused by the artist’s lack of drawing skills. He succeeded in the profile view to show us that sucker as deeply concave. Had Schlechter written the description himself, there is little doubt that he’d have described the upper surface of the corona lobe as “canoe shaped.” I have seen and examined the holotype specimen so I know that I have described these parts correctly. Ms. Wayman cannot make that claim! Figure 2, part b (upper surface of corona, showing all lobes). The lobes appear almost flat but they are very shallowly concave near the lateral margins with a raised area in the center. This raised area covers a large portion of the lobe. It isn’t just a small umbo set in the center, as is true of Hoya cagayanensis. Part d. is the corona profile. Note the extremely different shape of this one. Left: The little figure on the left is a cross section view of a CMF-8 corona lobe.. Right: The little figure on the right is a cross section view of a Hoya cagayanensis corona lobe. The best way I can describe the corona lobes of Hoya cagayanensis is to say that they appear to be flat and that someone put a tiny little canoe on top of each of them and left them there. Inside the canoe of some (not all) some kid left a wee little ball that settled near the center. The absence of the wee little balls (umbos or bosses) in some (or their presence) may be due to over or under pressing of the material as it dried. IF THAT’S NOT ENOUGH, how about the leaves? 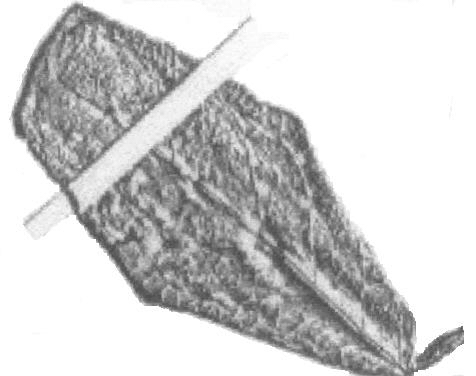 The above leaf, with the folded under apex and rolled up lower margins, is one of three leaves found on the holotype specimen of Hoya cagayanensis. Veins could not be seen clearly on the other two leaves due to them being so wrinkled. They appear to have been dried without pressing. 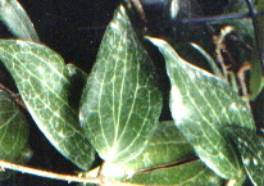 If you look closely at the above, you can see that the veins are arranged in a pinnate pattern. I counted 7 pairs of veins before reaching the folded under tip. The green leaves, above are leaves of Hoya sp. CMF-8. . It is very easy to see that CMF-8 leaf veins conform to the pattern which Stearn’s Botanical Latin defines as “triplinervis” and “quintuplinervis.” This type of nervation differs from trinerved and quinquenerved in having one pair of lateral nerves originate slightly above, instead of right at the base of the leaf. These lateral nerves run more or less parallel to the midrib in the same manner as trinerved and quinquenerved. The outer pair of nerves extend almost to the leaf apex. CMF-8 IS NOT HOYA CAGAYANENSIS, NEVER HAS BEEN, NEVER WILL BE, NO WAY!! I do not know what it is. I suggest that, to avoid confusion, that you retain the CMF-8 label or, if a true identity is never found, until it is published and given a proper name. The longer it is called by the misnomer of Hoya cagayanensis the harder it is going to be to find it correctly labeled in the future. The above misidentification is only one of many things in Vol. 17 #1 that I found provably wrong. It is just the worst. The entire issue is a big mess. “If seven maids with seven mops swept for half a year, do you suppose the Walrus said, that they could get it clear?” I doubt it said the carpenter and shed a bitter tear!” (Lewis Carroll). That is how many of us feel every time an issue of Fraterna or a new Kloppenburg book appears.